If you are a Jessica Rabbit fan, once 2003 hit, your wallet was definitely starting to slim down. Not only was a new Jessica pin coming out often, but there were also a new crop of shirts offered. Some of them depicted the diva of Toontown dressed in a bikini and grass skirt, which seemed to become a new fan-favored look. 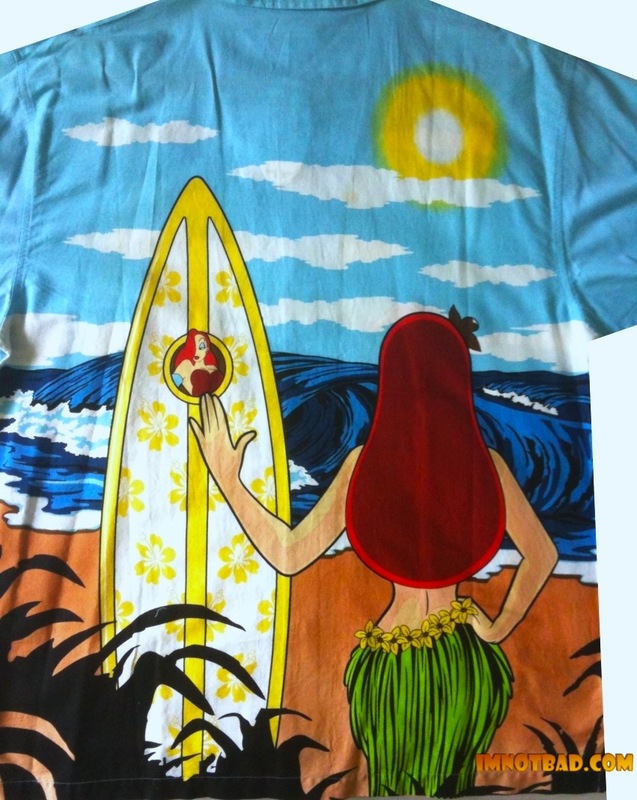 The Jessica Rabbit With Surfboard button down shirt was certainly made to add a lot of va-va-voom to your wardrobe. The bedroom eyes, the pouty lips,... the gold bikini top... and the surfboard? Jessica Rabbit may have many talents we never knew of. 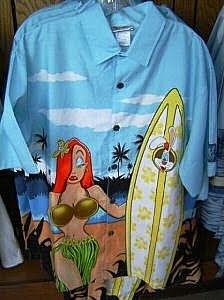 This bold shirt was offered some time in 2004 in Walt Disney World. Jessica's new bikini-clad ensemble was now a common look - and for obvious reason becoming a fan favorite. 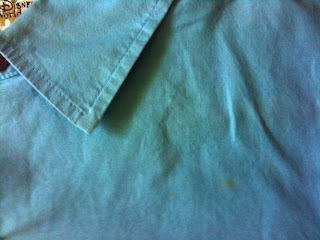 The shirt is light enough to wear on hot days but is definitely a heavy enough fabric as to be worn on cooler nights. 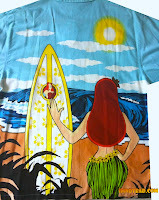 It's a full button down, short sleeve shirt with a collar - and is printed with the image of Jessica holding up a large surfboard on the front and back. 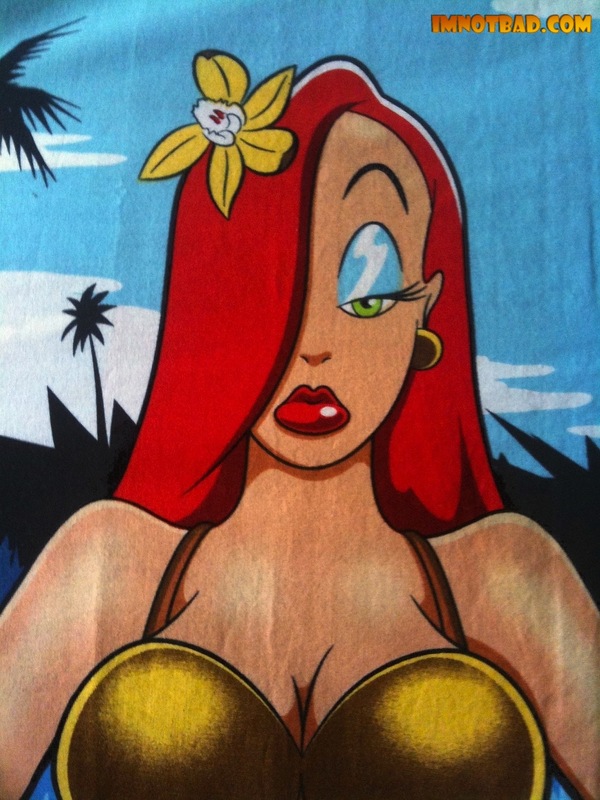 On the front of the shirt we see Jessica Rabbit, decked out in a gold bikini top, and grass skirt lined with yellow flowers at her waist. She also has a large yellow flower in her hair. She's got one extremely pouty lower lip, but her overall look is very on character - and it's quite a stunning and up close look at the cartoon beauty for a change. She is holding a large surfboard with yellow border and flower pattern - and a picture of Roger's face at the top. Most of the background of the shirt is light blue. The sky is behind Jessica, with some clouds passing by. There are some palm trees in the distance, and also some grass - which is varying blue shades. The sand is a tan color, and there are also more plants in the foreground which are black. The left sleeve has an embroidered dark blue tag which reads: Walt Disney World - Hang Loose - Live, Love and Relax. Inside the Hang Loose letters, you can see a light blue Mickey Mouse glove. If the front of the shirt was not enough to get eyes popping, the back certainly will. On the back - is the backside of Jessica. We see over her as she is looking at the dark blue waves. Her surfboard also now has a picture of her on the reverse side. The top of the shirt is again the light blue sky with some white clouds, but this time we can see the sun shining down. Jessica stands on the tan sand and there are the black plants in the foreground. There is also an element of shading added to the shirt which can clearly be seen on Jessica's skin and hair. It's not just a flat color, so the added shading gives her a lot more dimension - making it more faithful to how we see her on screen. Though the shirt is made with the Disney World logo, it is possible it was also available in Disneyland as well, with the corrected embroidered tag. By this time, both parks were offering Jessica merchandise and were known to just switch out the correct park logos accordingly. Though this shirt is getting a little old now, I have had it protected rather well, and never wore it. When taking photos for this review, I noticed some tan spots scattered on the light blue portion of the shirt and collar which are very noticeable. I doubt it came to me that way but I can't imagine what could be causing that. This was quite a surprise release by Disney, as most of their park merchandise is. For Jessica, it was another push for the character at the time to get her back in the public eye, and with some new merchandise as well as a new look. While it can be worn by anyone I'd say it's definitely more of a man's shirt, and I've seen several photos on the internet over the years of men wearing it. It can be found on eBay now and again, and is definitely worth picking up. 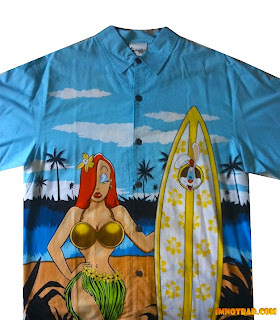 The Jessica Rabbit Surfboard Button Down Shirt gets a 4½. It's a great, fun bold shirt - maybe too loud for some. There is some aging showing in the material even not being used, but I'm still not sure what is attributing to that.